MARKET: How is the situation with overstock and no-name competitors on the European market right now? What we’ve been hearing is that the large amount of overstock in the European market in the past few years has finally, mostly, been flushed out. This should lead to a healthier market for everyone. No name competitors continue to be a factor in Europe, although not yet as significant as we see in the US. On our end, we had overstock of Loaded and Orangatang product (particularly in the German market) in 2015 and we and our distributors bought back all excess product and were able to maintain brand integrity. What are your main price points for next season? Most of our products fall within the 300-400 euro range. How can retailers generate growth and customer interest in cruisers? As always, employee knowledge and the ability to educate the customer is critical in order for retailers to be successful with skateboard products. Additionally, doing events like group rides helps grow the market and encourages the purchases of quality products. MARKETING: What is your collection theme and which stories are you telling to get customers stoked on cruisers with a true boardsports flavour? Natural materials (like bamboo, basalt, and bio-resin) and function-driven design are cornerstones of our brand identity. So riders who identify with these design sensibilities and appreciate these kinds of material selections tend to gravitate towards the boards we make. Are you noticing an increase in female riders? Are you targeting this segment specifically? We’re definitely seeing an uprising in female ridership! While we aren’t specifically targeting this segment, we generally orient our product and marketing to be very inclusive and to welcome any and everyone who is excited to ride. It seems obvious to us that encouraging female riders will have a positive impact on skateboarding’s future. How are you helping retailers sell your cruisers and educate customers (POS displays, etc.)? We devote a lot of resources to meeting with our distributors and ensuring that they have an intimate knowledge of our product. Our distributors are the first step in the process as they then disseminate all that information out to their retailers. We take great care in selecting and cultivating great relationships with these distributors, which allows us to fully entrust them with this responsibility. Furthermore, we periodically join our distributors to visit shops around trade show season so that we can answer any specific questions the employees might have about our brand and product and reinforce the work our distributors have already begun. 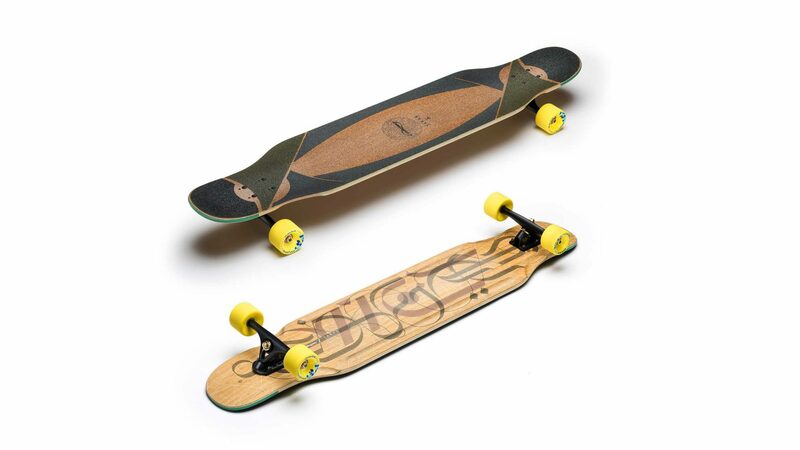 DESIGN: We are seeing a trend towards shorter longboards and cruisers with longboard constructions (drop-cruisers). Is that a trend you are serving? Technical cruiser decks do seem to have strong appeal provided a decent price point. To share some anecdotal evidence, we launched our Kut-thaka board, which is a cut down version of our Kanthaka, in October. It’s a 30.75” (78cm) board using our technical longboard construction. Response has been stellar. What are you doing with (eco) materials, colours and graphics? The vast majority of our boards use bamboo as their core materials due to its incredible eco and material properties. Additionally, we have been transitioning our line to bio-based epoxy. Finally, our finishing is all water-based. Colours and graphics continue to be driven in a bespoke fashion based on board concept. We don’t personally have any specific trends in our graphics as our boards are not designed to be seasonal. Where are wheels and truck trends going? We continue to see a push towards larger wheels on our longboard and cruisers. Additionally, we’ve had a great response on our proprietary softer (77a) formula wheels this year and intend to expand that formula across more of our line next year. BEST SELLERS: Please name and describe your 3 highlight pieces and items that retailers should definitely order.